3M Multi Purpose Spray Adhesive #77 467gm-Fast acting-Ideal for mounting photographs and prints - premium quality. 3M Art Spray Repositionable #75 267gm- Allows materials to be repositioned over and over again- Ideal for temporary mounting of all artwork and paper materials - premium quality. Spray Adhesive 400gram - Micador - Professional standard - quickly bonds many different surfaces - stays tacky to allow repositioning. For permanent bond spray both surfaces - for temporary bond spray one surface. Spray Fixative 450g - Micador - Gentle protection for drawings or pastels to reduce smudging- Art may be reworked later- Ozone friendly- Contains no fluorocarbons. Velcro Spot Hook & Loop 22mm X 62Pair Self adhesive 2 part mounting fastener- Peel a spot of hook and press on to the item- Peel a spot of loop and press on to the other surface- Press hook and loop firmly together. 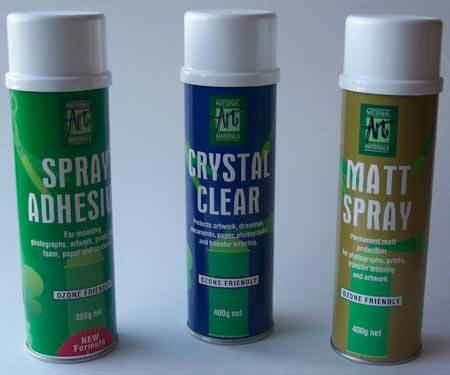 Spray Crystal Clear Gloss 450g - Micador - Protects artwork, drawings, documents, paper, photographs- Prevents tarnishing of copper- Ozone friendly- Contains no fluorocarbons. Matt Spray 450g - Micador - Permanent matt protection for drawings, layouts, artwork, prints and photographs- Ozone friendly- Contains no fluorocarbons.